Rob Scott is the Senior Director for Mobile Strategy at Cincinnati Bell, Inc. 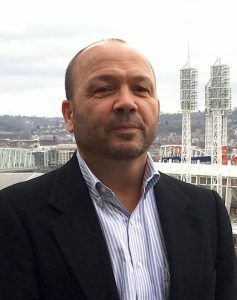 Rob helped launch Cincinnati Bell’s “Connect Cincinnati” Wi-Fi initiative in 2014, a process that required collaboration with City, County, Business, and Real Estate stakeholders. Today, Cincinnati Bell provides free, high-speed Wi-Fi Internet to multiple iconic venues throughout Greater Cincinnati totaling more than 500 access points. This initiative also includes the “Connect Cincinnati” mobile app, which gives users access to exclusive deals at more than 200 businesses that are part of the Connect Cincinnati mobile app’s ecosystem. Rob has a 25-year track record of progressive achievements in the mobile tech sector across sales, product management, and logistics. He is a graduate of Ohio University.